The American Airlines story just keeps getting weirder. Apparently there is a website for gay American Airlines employees, amrgleam.com. The discrepancies between what was reported by the media and the American Airlines' position were of concern to GLEAM. The GLEAM co-chairs have read the New Yorker article and also reviewed crewmember reports and customer communications to try to more fully understand the situation. Our assessment based on the accounts we have read is that the crewmembers acted reasonably. The New Yorker is highly regarded for its fact checking and accuracy, so any "discrepancies" would be a big surprise. None are specifically outlined by Gleam. Still, something is off. American Airlines won a big award from Out Traveler magazine, with readers voting it "Gold Standard U.S. carrier for hospitality and service." 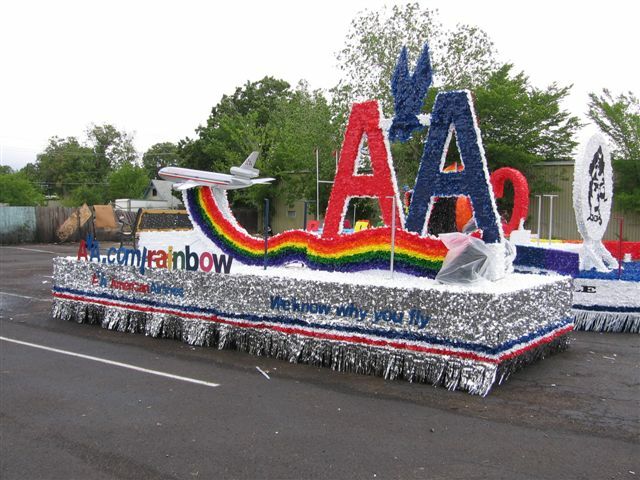 The airline has the only GLBT-dedicated sales team in the industry. All this according to AA.com/rainbow. Either the airline industry is just burningly, virulently, extremely anti-gay, allowing American Airlines to be the most gay-friendly airline and still have a no gay snuggling policy, or the New Yorker is wrong. Or something big was left out of that story.